The Scion XB has a very good reputation for reliability. However, Toyota reports that there has been a problem with piston rings in 2008 & 2009 models. This problem causes excessive oil usage and may cause serious damage to the engine. How widespread is this problem among owners of 2008 & 2009 Scion XB owners? 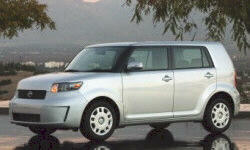 How seriously should a prospective Scion XB purchaser, such as myself, take this problem into account? I bought my '08 xB in '07. Only use Mobile 1 or Cen Tech full synthetic oil and Purolator oil filters every 8,000 miles. 130,000 miles later, it runs like a top and doesn't burn any oil. The 2008-2015 xB have problems with power steering more often than oil consumption. Oil consumption is the 2nd most common issue in these, but it is not a huge deal because the number of reports is very small. When the power steering fails, it is harder to steer and if you don't take action you could cause an accident. The car is very reliable, but those are the two complaints. I don't think these problems should hold back a buyer if you like the car.